The mission of Sources of Strength is to prevent suicide by increasing help seeking behaviors and promoting connections between peers and caring adults. 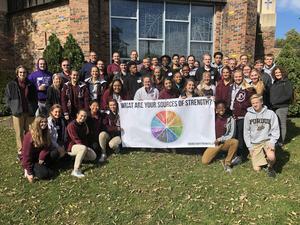 The student peers leaders selected were a diverse group of individuals who were taught to leverage their personal and collective leadership qualities as well as their social influence to use strength-based messages to impact multiple issues within a school community. Sources of Strength believes that when students see friends, family or others stuck in unhealthy situations that it is their duty to connect them to a source of strength that can assist, support and guide the individual to a better place. At the end of training, students and advisors brainstormed ideas that they will activate throughout the school year to help promote youth-adult connectedness and build positive community. We are a group of diverse students and adults from many different corners and cultures of our school and community. We believe that life has ups and downs, that all of us will go through good times and tough times. Our mission is to ensure that during the rough times no one gets so overwhelmed or hopeless that they want to give up. Our mission is to spread Hope, Help, and Strength into every corner of our community. Our mission is to help students and staff turn to their strengths and their supports that are all around. We are Connectors to Help and Strength. Our mission recognizes that our voice has great power and we use it to BREAK the SILENCE when someone is struggling, and to connect them to the help they need and deserve. We Spread Hope by focusing on stories of strength, rather than on stories of trauma. We know our most powerful impact comes from our personal actions, conversations, and messages that use our music, our art, our writing, our activities, our social media, our culture, and our voice. This gives life to our efforts.